A marathon is a long distance running sport event where an athlete must run 42.195 kilometres (26 miles and 385 yards). There are many marathons held all over the world each year. It is a very difficult event and runners are advised to run many miles before they compete. This event was named after a battle of the Greco-Persian wars. 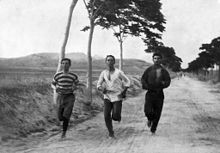 The first Olympic Marathon race of 1896. The famous battle of Marathon was fought in 490 B.C. An army from Persia came to fight the army of Athens. The army from Athens was not expected to win, but they did. After the victory, they sent their best runner, a man named Pheidippides back to Athens to tell everyone the good news. He ran about 25 miles and died of exhaustion when he arrived. In 1896 the first modern Olympics was held. There was a race called the Marathon there. It was only about 25 miles then. ↑ "IAAF Competition Rules for Road Races". International Association of Athletics Federations. International Association of Athletics Federations. 2009. Retrieved 2010-11-01. This page was last changed on 27 September 2018, at 10:36.